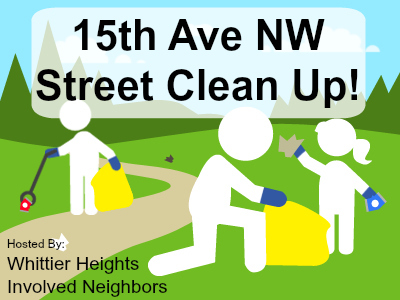 Happening Saturday — 15th Ave NW Street Clean Up! Whittier Heights Neighbors invite you to join them in cleaning up 15th Ave NW. They will provide gloves, garbage bags, and a few trash grabbers. If anyone has extra trash grabbers, please bring them! Wear bright colored clothing and reflector gear if you have it, good to be visible even during daytime. They will be meeting at the Walgreens on 15th Ave NW /NW 85th St at 1:00pm on March 14th. This entry was posted in Uncategorized and tagged ballard, street clean up, whittier heights, whittier heights involved neighbors by West Woodland, Ballard. Bookmark the permalink.